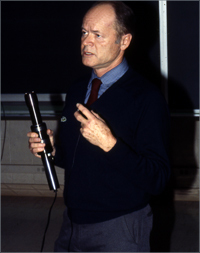 John Wheatley was Professor of Physics and President's Chair at University of California, Los Angeles (1985-1986). Other institutional affiliations included Los Alamos National Laboratory, University of California, San Diego, and University of Illinois, Urbana-Champaign. His research included the study of quantum fluids at low and very low temperatures. February 17, 1927Birth, Tucson (Ariz.). 1947Obtained BS in Electrical Engineering, University of Colorado, Boulder, Boulder (Colo.). 1952Obtained PhD in Physics, University of Pittsburgh, Pittsburgh (Pa.). 1952 – 1966Instructor to Professor of Physics (1952-1966) and Member, Center for Advanced Study (1965-1966), University of Illinois, Urbana-Champaign, Urbana (Ill.). 1954 – 1955Guggenheim Fellow, University of Leiden. 1966 – 1981Professor of Physics, University of California, San Diego, La Jolla (San Diego, Calif.). 1975Member, National Academy of Sciences. 1980 – 1981Guggenheim Fellow, University of Leiden. 1981 – 1986Researcher (1981-1985) and UCLA-Los Alamos Joint Fellow (1985-1986), Los Alamos National Laboratory. 1985 – 1986Professor of Physics and President's Chair, University of California, Los Angeles. May 10, 1986Death, Los Angeles (Calif.). Advised by Wheatley at University of Illinois, Urbana-Champaign, "Thermal Conductivity of Liquid Helium-3" and both employed at University of Illinois, Urbana-Champaign. PhD advisor at University of Pittsburgh, "Quenching of Positronium by a Magnetic Field." Advised by Wheatley at University of California, San Diego, "Measurements of Johnson noise using an rf biased SQUID and its application to Millikelvin thermometry" and both employed at University of California, San Diego. Both employed at University of California, Los Angeles. Both employed at University of California, San Diego, Los Alamos Scientific Laboratory, and Los Alamos National Laboratory. Researcher and UCLA-Los Alamos Joint Fellow. Professor of Physics and President's Chair. Instructor to Professor of Physics. John Wheatley National Academy of Sciences biographical memoirs. John Wheatley Physics Today obituary.